The wait is finally over! What was the mysterious sample on Instagram? 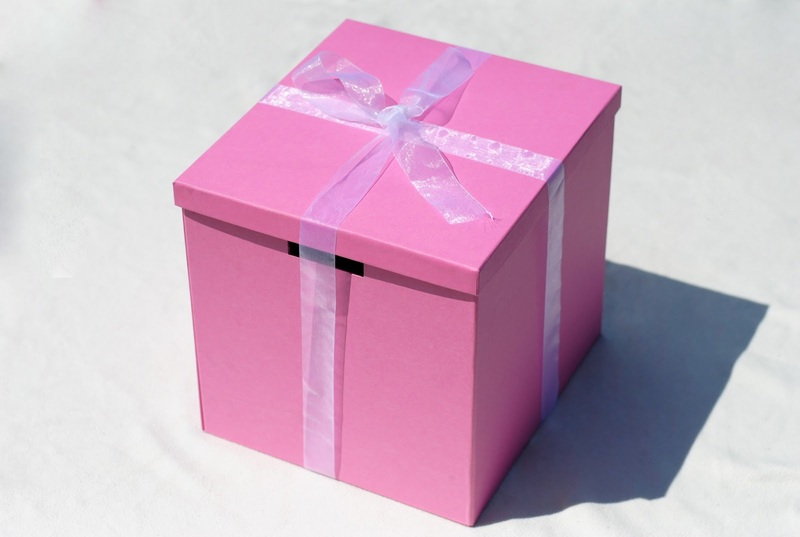 My big pink hydration box was from Biotherm! Biotherm thinks hydration is one of the most important things, and it simply is. Our skin loses up to half a liter fluid a day. How? Because of a variety of factors. Weather (UV-rays damage the skin), urban environment (CO2 and SO2), lack of sleep, stress, airconditioning,... But also things like hormones, medication, ageing and also: agressive skin scrubbing or purifying routines. There are tons of ways to stay hydrated throughout the day. The most important one is drinking of course. To jazz up your drinking routine, you can make some fruit infused water like I did. (It's so fresh for those warm days.) Or for the colder days, why not drink a cup of tea? I enjoyed a nice cup of mint tea during my hydration challenge. Besides drinking, you can also eat some fruits which hold a lot of water, like pineapple for example. That's why there was one in the hydration box, lots of water and vitamins! I also got a little book called "Cool Waters" written by Brian Preston-Campbell. There are 50 refreshing, healthy and homemade thirst quenchers in it. 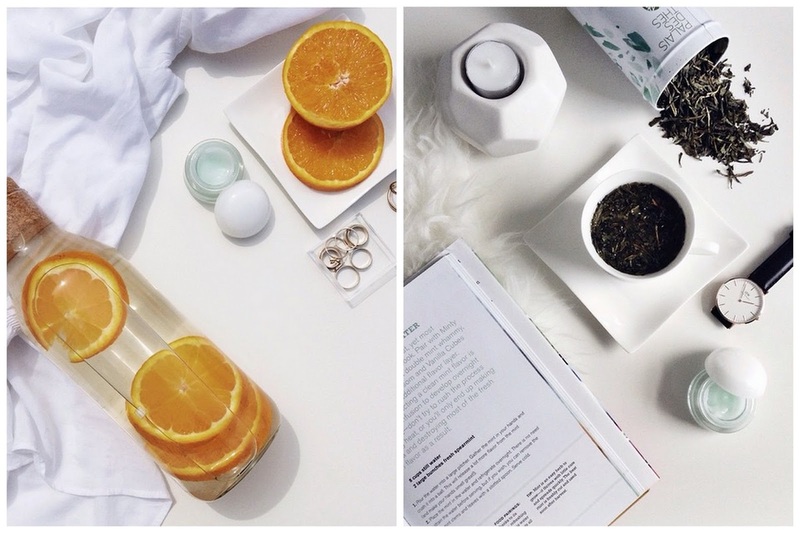 From things like 'Honeydew-mint mist' to pressed watermelon water with basil. A lot of recipes I would have never even thought of! 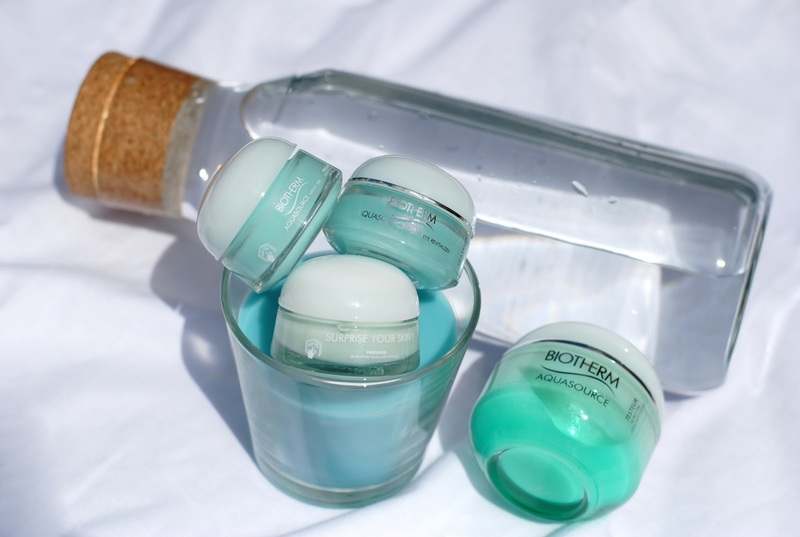 But Biotherm came up with another idea, hydrating your skin through skincare. Something to put in your everyday routine. And that's what the Aquasource line is all about. Biotherm recently released three new products, so today I'm reviewing the newbies: the gel, the total eye revitalizer and the night spa. The Biotherm Aquasource gel was also the one that was in my little sample. Part of the challenge was to use it for 5 days and only after those look in the bag to reveal from who the product was. At first I had no idea who could have sent the box, but when I saw the cute jar, there rang a little bell. It has a hydrating formula extra-charged in regenerating Life Plankton and moisturizing Mannose to keep the skin ideally hydrated hour after hour, whatever the conditions. What is Life Plankton? It's an ingredient that's complimentary with our skin. It works on the different types of skin cells and functions. The Life Plankton itself has 5 different functions: Biosynthesis (stimulating keratinocytes and fibroblasts), integrity (protecting the skin against destruction, calming effect (less redness), more strenght and an antioxidant effect. If it's well applied the skin should stay hydrated for about 7 hours. So that's about 500 hours a jar! The structure is gel, so it feels very smooth and is easy to apply. The gel also smells great. It smells fresh, but I can't really compare it to anything. Just a really nice scent! What did I experience in the last two weeks? It absolutely does what it promises. My skin was hydrated throughout the whole day. I applied the gel at morning and at night for the first 5 days, after that I found the Night Spa in my little bag, and used that one at night. It just worked, my skin was hydrated. Sometimes my skin would feel drafty, but I didn't had that feeling since I used these, so I guess I can say: these are little hydration miracle workers! Next is the Aquasource Night Spa. Normally this comes in a bigger size, like the gel above, in 50 ml. The nighttime spa is here to replenish moisture levels while you sleep. What does it do? Transforming the skin, even out dehydration lines, water-plump the skin. You can use this one in a few different ways. The classic way: use it as a mask, and apply it thick. Leave it on for about 5 minutes, remove the excess and end with a rain & waves-massage. Or you can just skip the mask and massage and use it as a night-cream to keep you hydrated throughout the night. This structure is more firm than the other two. It's less gelly even though it's still clearly a gel, but it also reminds of a cream. So let's call this a gel-cream. It smells a little different than the gel, a little less 'fresh' and more 'creamy'. I really like these scents! That's how I used it. I can't say much more than what I have said above: my skin was hydrated, just like it was supposed to! This is Biotherm's first flash eye awakener and it gives your eyes a totally revitalized look. Bags are depuffed, dark circles reduced, dehydration lines smoothed, eye contour continuously hydrated. It also has a beautiful color, shimmery pink-blue. It just looks pretty! And the scent, just like the other two: love it. I was happy to finally have an eyecream. I was looking for one, for a long time. But I didn't found anything that would suit me. The main things an eyecream has to do for me are reducing dark circles and smoothen fine lines. And the Total Eye Revitalizer does that. I think this was a helpful cream. It didn't really do much for my dark circles, but the results were measured after four weeks, so I still have two more to go. It did even the fine lines and was perfect as a pre-make-up base. Biotherm also measured the cooling effect, after two minutes the skin temperature dropped to -2C where the gel was applied. I don't think my temperature really dropped that much, but I also didn't measure it, so it could be possible. When you apply it, it does feel fresh and cool on your skin. A nice feeling in the morning! So my overall conclusion is: yes, these Biotherm Aquasource products do keep you hydrated. Very easily. It was a fun experiment, and I will continue using the products daily. Oh, and of course, who won the skincare goodiebag from the Instagram contest? Drum roll... @Gaelbat! Congratulations Gaël, an amazing goodiebag will be soon on it's way to you! Did you expect it would be Biotherm? And what do you do to keep hydrated? You're welcome sweet Gaël! Although it was just random luck, because the computer picked you! It was a really fun idea to guess which product it was, well done Biotherm! And I love the GIF , it looks great! Oh wauw, klinkt echt heerlijk! Wat een prachtige foto's ook! Those look so luxurious, love the gif! Your pictures are gorgeous. :) mint tea is the best! I love making sweet mint ice tea in the summer. So refreshing! :) wonderful post! wat een uitgebreide review en super mooie foto's zeg!